Deutsche Bank could move up to 4,000 jobs out of the UK as a result of Brexit – nearly half its UK workforce. The possibility raised by the firm’s chief regulatory officer was the latest warning from a financial firm since the UK voted to leave the European Union. Currently, UK-based companies can conduct business throughout Europe, but could lose that right. The warning came ahead of Deutsche’s latest results which showed that job cuts had boosted profits. The bank reported that first-quarter profits more than doubled to 575m euros (£490m), helped by cost-cutting efforts which have seen 3,300 job losses in the past 12 months. 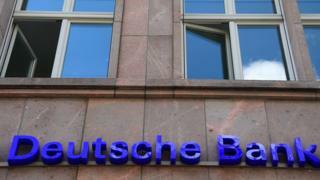 Germany’s biggest bank has previously said it is committed to the City of London. But speaking at a conference in Germany on Wednesday, Sylvie Matherat, chief regulatory officer at Deutsche, suggested it was considering job moves as a result of Brexit. The positions in question include not just front office jobs, but also roles in IT and risk management, she said. “For front office people, if you want to deal with an EU client, you need to be based in the EU,” she said during a panel at the Frankfurt Main Finance Conference. She added that an additional 2,000 jobs linked to risk management could also face relocation. Despite the warning, the bank last month entered negotiations for a new London headquarters with a 25-year lease.